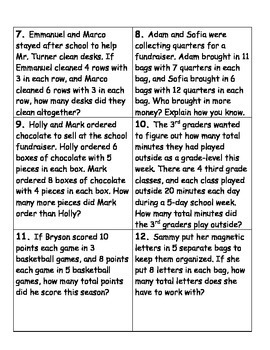 This product features 12 multiplication word problems on a 2x3 grid and a recording sheet for students to solve problems and record their answers. 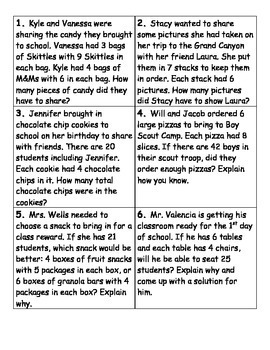 There is a mix of 1 and 2-step word problems. In my own classroom, I have printed out 2 copies of the document. In class, pass out the cards to students. They walk around and find the other student who has the same card number as them. The pair sits down together and solves the problem on their recording sheet. Repeat and share when finished. I have found that it turns somewhat monotonous word problem practice into an engaging, fun activity. 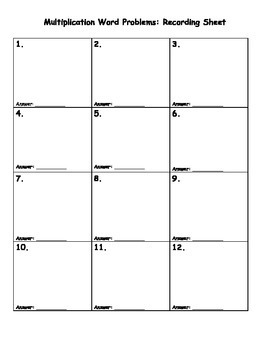 An answer key with explanations is included for quick grading. 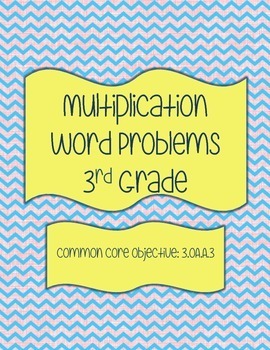 CCSS.Math.Content.3.OA.A.3 Use multiplication and division within 100 to solve word problems in situations involving equal groups, arrays, and measurement quantities, e.g., by using drawings and equations with a symbol for the unknown number to represent the problem. CCSS.Math.Content.4.OA.A.2 Multiply or divide to solve word problems involving multiplicative comparison, e.g., by using drawings and equations with a symbol for the unknown number to represent the problem, distinguishing multiplicative comparison from additive comparison.